Black leather fitted gloves. Wrist length. Strap at the wrist, an opening between wrist and where the fingers begin. Long black riding boots. Should be just underneath the knee in length. Hair must be pulled back, in a french twist type of fashion with a couple of stray hairs hanging towards the face-line. Black or dark brown high-crew neck undershirt or equivalent dickey. Dark brown semi-fitted long sleeve tunic with kimono collar and 12-15" sleeve wrist openings. Fabric may be crinkle or smooth textured and have red to olive tones. Dark grey or black fingerless gloves. Khaki or tan pants, stonewashed cotton or suede leather/ultra suede. Medium to dark brown knee-high leather or pleather boots with plain tops or Qui-Gon style cross straps. Dark brown Obi-Wan or Qui-Gon style jedi belt with no pouches, food caps, or saber clip. Medium to dark brown 3-4" wide strap armor harness extending from back center of belt line in a "V" up over the shoulders. Can attach to breast plate and/or continue down front to belt line. Medium brown (red to olive tone) fabric tabards, extending from belt line to just above the knees. Rigid weathered silver breast plate with belly control-box, extending from belt line to mid-upper chest. Rigid weathered silver shoulder bells, extending from slightly above the shoulder to mid upper arm. Dark brown leather bandoleer with rectangular buckle at chest level and single flap-closure pouch at belly level, extending from over right shoulder to left waist. Long black/silver lightsaber hilt. Can be attached at back of bandoleer or hand-held. If bladed, must be green blade. Slicked back or loose medium length (below ears) straight hair with minimum grey/white highlights. Boots should have Qui-Gon style cross-straps. Bandoleer should have cross-etch lines throughout, and a narrow center strap extending from the buckle over shoulder to back. Pants should have hidden/no back pockets. Hair/wig should be pulled in a top-knot high on back of head. 2 spats from the ankle to just below the knee that matches color of lower arm gauntlets, each spat has two clasps at the top on the outside of the leg. 4 separate black belts starting at the waist and going up (each belt aprox 1") each belt has a separate belt closure. The second belt from the bottom wraps inside the tabbard on the L side, and outside the tabbard on the R side. Non-toy lightsaber hilt or custom lightsaber hilts are allowed. Short hair, does not have to be buzzed. But no long hair allowed. 1. Gray flannel or flannel like shirt with both arms cut off or under-rolled to the lower bicep area. No stitching should be apparent on rolled up fabric, no frayed edges on bottom. 4. Front and back gray cloth tabards extending from upper belt hanging to mid-knee. Front tabard is tapered from mid thigh width. Rear tabard is tapered from waist width. Tabards should be appropriately �weathered� at bottom to represent wear. 5. Leather or similar fingerless gloves. Each glove has black metallic backing armor that runs from the knuckles to mid hand with two edges folding inwards, ending at wrist. 6. Dark (dark and light gray) cloth or leather wraps around base of glove that end approximately 1-2� below the elbow. 7. Dark (dark and light gray) cloth or leather wraps around arch of boot, circling the leg up to the top of the boot. 8. Chest harness consisting of two dark brown leather/leather like belts that cross the body at chest level and stomach level. Top harness has two straps leading up to attach to top of back armor. 9. Shoulder bell armor of metallic or metallic appearing construction. Should curve along the shoulder, sloping higher towards the neck. A second additional upper arm armor bell of similar construction should be attached to upper harness. 10. Connected back armor consisting of dark brown leather/leather like armor stretching from top of back to bottom of ribs. Armor should have four evenly spaced rectangular leather plates, vertically oriented. 11. Dark brown leather/leather like waist belt. Belt has unique belt buckle on front along with two circular buckles on left and right. Trailing belts off front and back support large dark brown leather/leather-like pouch on thigh. 12. Pouches � Marek has 4 other dark brown leather/leather like pouches � two small pouches directly under the arms attached to upper chest belt, two larger pouches on waist belt. 13. 2 identical non-toy, PVC or custom lightsabers. Sabers may attach to left and right side of main belt (in-game version) or on harness (trailer version), but not required to attach. If bladed, blades may not be red or black. 14. Short or crew-cut hairstyle similar to Marek. No long hair allowed. Costumer should be clean shaven. 3. 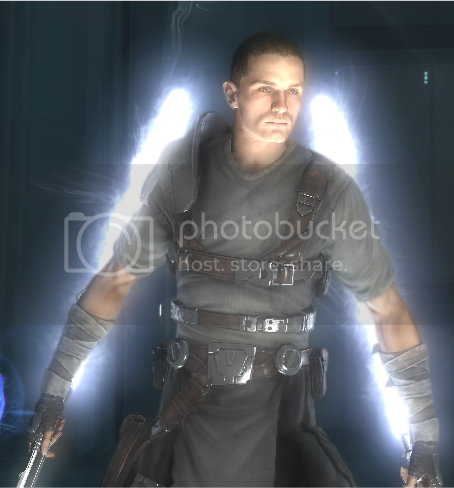 Starkiller style arena sabers or in-game sabers. 1. White long sleeve mock turtleneck / white long sleeve crew neck shirt. 2. 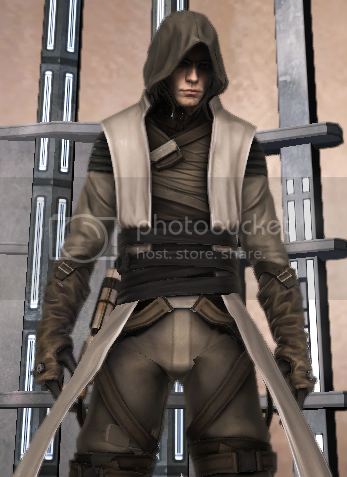 White cowl / hood (attached either to the dark tan vest, or to the turtleneck in the rear). 3. Dark tan vest w/ single tabbard on L side going down to mid-shin. Vest needs to have three shoulder tucks on each side, & drop down to the mid upper arm on both sides. 4. Dark tan arm wrappings on both forearms from elbow down to first row of knuckles. 5. Large white obi. Obi should be wide enough to go from pants waist to mid-chest. 6. Narrower (aprox 3") dark tan sash wrapping several times around large white waist obi. 9. Lightsaber (No toy sabers or Ultimate FX short saber) carried in hand. 10. Dark brown leather or leather-like boots rising to just below the knee. Rubber boots not allowed. 11. Costumer should be clean shaven. Short hair preferred, but if costumer has longer hair, should be completely hidden inside cowl.